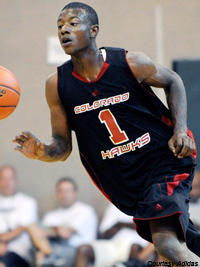 Is well-traveled former five-star recruit Chris Thomas worth the risk for Marshall? Whereas college basketball's upper crust can afford to be choosy about which elite recruits they offer scholarships, most less prestigious programs occasionally have to take risks to add a high-level talent. That's why Marshall is willing to gamble on a onetime five-star recruit with a long history of attitude issues and legal problems. Chipola College's Chris Thomas, a 6-foot-4 wing once considered one of the Class of 2012's top guard prospects, will enroll at Marshall and be eligible to play next season, Thundering Herd coach Tom Herrion confirmed Monday to the Charleston Gazette. Thomas averaged 9.9 points, 5.3 rebounds and 3.2 assists in his lone season at Chipola and will have three years of eligibility remaining at Marshall. A guard with Thomas' size, athleticism and long-range shooting ability doesn't normally end up at a program with Marshall's modest pedigree, but Thomas has taken a winding road to Division I basketball. The Denver native spent time at high schools in Colorado, Maryland, Arizona and Connecticut before enrolling at Chipola to earn his GED. He originally committed to Xavier in high school, backed out of that decision a few months later and signed a letter of intent with Manhattan this year only to have his scholarship pulled after a spate of legal trouble. Late last year, Thomas was granted a conditional release after being arrested in Florida for driving without a valid drivers license and operating an unregistered vehicle, according to the Jackson County Floridian. He violated the terms of his release in March when he tested positive for marijuana, landing him in jail during the state tournament and costing him his spot at Manhattan. "We have to make some decisions as a program, is that something that we want to move forward with and that type of thing,” Manhattan head coach Steve Masiello told NYBuckets.com back in June. "We’re going to evaluate that a little more and probably make a decision in the next couple days." Why would Marshall gamble on a player even a small-conference program like Manhattan thought wasn't worth the risk? Well, first and foremost, the Thundering Herd are in dire need of a talent infusion in the backcourt. Three-time all-Conference USA guard DeAndre Kane and fellow starter D.D. Scarver left Marshall in April, creating a void at shooting guard. Herrion did previously add junior college transfer Justin Edmond, but the only returners at shooting guard are Tamron Manning and DeVince Boykins, both of whom combined to average less than two points per game last season. Thomas surely has an opportunity to contribute at Marshall immediately if he can avoid trouble on and off the floor. Marshall has a history of taking such risks under Herrion, with both positive and negative results. Kane emerged as the most productive player of Herrion's tenure before leaving for Iowa State this spring, but onetime top 50 recruit Justin Coleman was dismissed from the team in 2012 after whipping out his cell phone on the bench during a game. Only time will tell whether Thomas will turn out more like Kane or Coleman. Considering the void at shooting guard Marshall has, the Herd have to hope it's more the former than the latter. • Can Trae Gordon fill Georgia Tech's void at point guard?